A lecture given to members of the Anthroposophical Society in Dornach, Switzerland, on May 29, 1924. From stenographic notes not revised by the author. In my last lecture here I spoke of how man is related to the Spiritual Hierarchies during the different periods of his life. I should like to repeat that the aim of all these lectures is to lead us to a better understanding of how karma works in human life and in human evolution. Everything is really a preparation for this. I told you that from a person's birth until about his 21st year, the Third Hierarchy [Angeloi. Archangeloi, Archai], is related to him in a special way; at the age of puberty the Second Hierarchy — Exusiai, Dynamis, Kyriotetes — begins to work. These Hierarchical Orders continue to work from puberty until the 21st year in the first period of their influence; in the second period they work until the 28th year, and in the third period until the 35th year. But from the 28th year onwards, an inner relationship begins with the First Hierarchy — Seraphim, Cherubim, Thrones. These Beings of the First Hierarchy continue working, in the first phase of their influence, until the 35th year (during which period they co-operate with the Second Hierarchy), in the second phase, until the 42nd year, and in the third phase until the 49th year. Now the influences exercised directly by the Hierarchies during the various periods of man's life interweave, as it were, with the influences which play, as reflections, into these periods of life from the Spiritual Beings of the planetary spheres. As we look at the outer, physical radiance of the planets, we know that each of these heavenly bodies is but the sign that in the direction where we behold it there is a colony of spiritual Beings in the cosmos. Our constitution as human beings is such that within the physical body we have an etheric body. The moment a man acquires the faculty of supersensible, Imaginative Knowledge, he is able to perceive everything that can be revealed to him through the etheric body. And then, as he looks back over the tableau of his earthly life since birth, all the events he has lived through and the forces that have influenced his development and determined his organisation of body, soul and spirit, lie manifest before the soul's eye in a mighty panorama, as if time had become space. At this stage of Imaginative Consciousness on the path of Initiation, life can be surveyed in this way. When, however, the stage of Inspiration, Knowledge through Inspiration, is reached, a higher revelation is added to the memory-tableau of the earthly life. This higher revelation is possible because in Inspired Consciousness the Imaginations are suppressed and the pictures of the events of earthly life, even when they have been perceived through the etheric body, are no longer there. If by means of a diagram I were to represent this backward survey as a stream (drawing it as if presented to physical sight, not to the eye of soul) you must picture that the several phases are blotted out in Inspired Consciousness and manifestation of a different character revealed. First of all, something is revealed within this first phase and if we can find our bearings in the sphere of Inspiration, we become aware of what it is that is actually appearing. Please understand me. We gaze at a tableau of the whole of earthly life. Part of this tableau is obliterated, blotted out as it were, when Inspired Consciousness has been attained on the path of Initiation — in this case the phase in the memory-tableau from birth until the 7th year. This is blotted out and in its place the deeds resulting from the connection between the Moon Beings and man after death lie manifest before the eye of soul. I told you, for example, how the life after death undergone by the personality who was the model for Strader in the Mystery Plays, was experienced. What happens in such a case is that one looks, first of all, at the memory-tableau; then, in Inspired Consciousness, this memory-tableau is obliterated. When the part of the tableau corresponding to the period from birth until the 7th year is obliterated, the deeds of which I have told you are made manifest — the deeds wrought by the Moon Beings in connection with the human being after death. Such experiences are possible when the course of life from birth until the 7th year becomes transparent and the Moon Beings and their deeds are revealed. Vision of the revelations connected with this phase of life is possible for every Initiate and is indeed the easiest to attain. As you will readily understand, Initiation is possible at any age in life, with the exception of early childhood. Children up to the age of seven are not, as a rule, initiated. And if what I am now describing is to be seen and understood, one must, in the present earthly life, have passed beyond this age. Everyone who is initiated has passed the age of seven. That is why vision of what is disclosed by this first phase of life is comparatively easy to attain. What is here revealed are, as we have heard, the experiences undergone by a human being after death during the backward journey which lasts for a third of the time of his earthly life. A second revelation is possible when that part of the backward survey which corresponds to the years between 7 and 14 — that is to say, to the time of puberty — becomes visible to Inspired Consciousness. The experiences lived through by the human being after death as he ascends from the sphere of the Moon to that of Mercury are then revealed. Having traversed the sphere of the Moon, man ascends to the sphere of Mercury. But in order to establish relationship with human beings in the Mercury-sphere, the phase of life between the 7th and 14th years, between the time of the change of teeth and that of puberty, must be obliterated from the memory-tableau. If in Inspired Consciousness, the next phase of life is obliterated, enabling what can become visible here to shine through, the experiences undergone by man in the sphere of Venus after death are revealed. Thus in looking back with the Inspired Consciousness of Initiation over these first periods of life, one beholds what is happening in the macrocosm, the spiritual macrocosm, to the Dead, the so-called Dead. You will realise from what I am saying that infinite wisdom is contained in the terminology used by ancient science. For the element of love is associated with the name of Venus. Vision of the Venus-sphere corresponds to the period of human life following the onset of puberty. Then there is a period lasting from the 21st until the 42nd year of life. When this period is revealed in Inspired Consciousness, one experiences — or can at any rate experience — what a dead person undergoes in the period that is by far the longest — in his life between death and a new birth, when he is living together with the Sun Beings. The Sun-existence between death and rebirth is now revealed. The Sun is a heavenly body of such might, embracing such a multitude of spiritual forces and spiritual Beings, that in order to perceive all the influences of the spiritual Sun-sphere upon the human being between death and rebirth, a period three times as long as the others must be obliterated from the memory-tableau, namely the whole period between the 21st and 42nd years. You will realise from this that Initiates themselves must have passed the age of 42 before they are able to look back upon man's connection with the Sun Beings between death and a new birth. This connection cannot be perceived in its fullness before then. To grow older, you see, has an important bearing upon spiritual vision itself. There are realities for the perception of which a certain maturity of years, not only a certain degree of Initiation, must have been reached. We come now to the period between the 42nd and 49th years. This is the point to which I tried to lead in the last lecture, for when man reaches his 49th year the possibility of direct relationship with the Hierarchies ceases. You will have gathered this from what I have said. We shall consider presently how it is with people who have passed the age of 49. If our attention is focussed upon influences which interweave with this phase of the tableau — we ourselves must of course have reached the age of 50 or more — and we look back at the span of time between the 42nd and the 49th years, we can behold the experiences a person undergoes after death in connection with the Beings of the Mars-sphere. But in this sphere the spiritual world begins to impart a strongly individualised character to the karma of the human being when he is on earth. You have heard that a person's karma is prepared during the period which immediately follows death and lasts for a third of the time of the earthly life. Karma is then gradually elaborated, and I have already indicated how this takes place. Karma is elaborated, wrought out, in union with higher Beings. Now there are people whose karma is elaborated mainly in the Mercury-sphere, or in the Venus-sphere, or in the Sun-sphere; and again there are others whose karma is elaborated mainly in the sphere of Mars. Human beings who by virtue of their earlier earthly lives bring into the spiritual world something that must be elaborated chiefly in the sphere of Mars, give evidence of this during their next life on earth. Let me give you an example. At the time when the influence of Islam upon civilisation had already spread across Asia, Northern Africa and into Spain, there lived a personality whose spiritual development proceeded, to begin with, in Northern Africa, in a School which in spite of having become decadent, was similar to the School in which, very much earlier, St. Augustine had spent the same phase of his life. The study in which this personality engaged in Northern Africa was entirely similar in character and trend. We must picture to ourselves that in those days the pursuit of knowledge was something very different from what it is to-day. Little is to be heard at the present time about the kind of study that was pursued so many centuries ago in Northern Africa by St. Augustine, or, later on, by the personality of whom I am now speaking. But at that time, particularly in Northern Africa, studies connected with the Mysteries were still possible although the Mysteries were in the throes of decline. The personality to whom I am referring had pursued such studies, had imbibed all that could be learned from them concerning the independence of the human soul, the realms experienced by the soul when liberated from the body, and so forth. Then this personality joined in the Islamic campaigns and went to Spain. There he absorbed much Islamic-Asiatic learning in the form into which it had already been re-cast in Spain; also much of the lore that had been spread far and wide by the Jews — it was not, however, the Cabbalism that was so universally cultivated later on, in the Middle Ages, but an older form of Cabbalism. And so in the early years after the Islamic campaigns we find this personality steeped in Islam but working along particular lines: reckoning, calculating, according to Cabbalistic principles. All this was lived through again in a later incarnation as a woman, when it was inwardly deepened, received by the heart rather than by the head. Then, later on, in the 18th century, this same individuality passed over into a man who has become a world-famous figure in French culture, namely Voltaire. This individuality appeared again in Voltaire. When our gaze is directed to the experiences lived through by this individuality between death and a new birth, before he became Voltaire — experiences that were the outcome of his previous earthly lives — we find that the fruits of his studies in Northern Africa, with their subsequent Cabbalistic trend, were wrought out in the sphere of Mars during the second half of his life between death and rebirth. 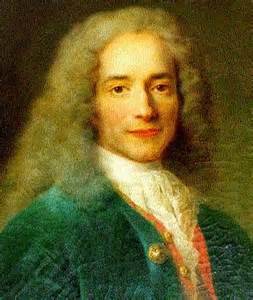 And with the results of the metamorphosis that can be wrought in the Mars-sphere, Voltaire came again in the 18th century as Voltaire. I am therefore able to bring him forward as an example of the elaboration of karma in the sphere of Mars between death and a new birth. Now the Mars Beings imbue everything with an element of aggressiveness, be it in the domain of physical, psychical or spiritual qualities. Nay more, they make a person combative, warlike by nature. This warlike element is compatible not only with attack but also with retreat; otherwise wars could not be fought! I think this was obvious enough during the [First] World War. Look at the Voltaire's whole life. It was a life in which splendid qualities of soul were developed, but it was a life of attack, of aggression, and also of withdrawal and retreat — at times engaging in attacks with almost foolhardy daring, at others evincing actual cowardice in retreat. It is much better to study these things from examples where the whole character and tenor of the life can be discerned than to study them in theory. That is why I am taking examples of this kind. And now when a person penetrates with the Inspired consciousness of Initiation into the phase of life between the 49th and 56th years — he must be considerably older than was necessary for the vision connected with the earlier periods — he attains knowledge of what the Beings of the Jupiter region can bring about in human beings during their life between death and a new birth. Acquaintance with the Beings of the Jupiter-sphere makes a very remarkable impression. One must of course have passed the age of 56 before this experience is possible. The first impression is one of astonishment that Beings like those belonging to the Jupiter-sphere can exist at all. I mean that as a human being on earth one is astonished, not as a human being between death and rebirth; for then, of course, one is actually connected with these Jupiter Beings. They are Beings who need not ‘learn’ anything, because the moment they take form — I cannot say ‘the moment they are born’ as you will presently see — they are already wise, supremely wise. They are never stupid, never unwise. They are as people on earth would often like to be, who do not appreciate the blessings of being taught and would prefer to be wise directly they are born. These Beings on Jupiter are not ‘born’; they simply arise out of the whole organism of Jupiter. Rather in the way that we see clouds forming out of the atmosphere, so do these Beings arise out of Jupiter, and once they are there they can be regarded as embodied wisdom. Neither do they die; they are merely transformed, they undergo metamorphosis. Jupiter is in essence weaving wisdom. Picture yourselves standing, let us say, on the [Mount] Rigi, and looking down at the clouds. And now imagine that you are looking, not upon weaving clouds of water-vapour but upon weaving wisdom itself, weaving thought-images which are actually Beings. — Then you will have an impression of Jupiter. Again let me give an example of the way in which karma can be elaborated in this Jupiter-sphere. There was a personality who lived in the later period of Mexican civilisation and was connected with the utterly decadent, pseudo-magical Mystery cults of Mexico; with an intense thirst for knowledge he studied everything with close and meticulous exactitude. My attention was attracted to him through having made the acquaintance some years ago of a curious man who is still engaged in a primitive form of study of the decadent superstitions of the Mexican Mysteries. Such lore is of negligible importance, because anyone who studies these things at the present time is studying pure superstition; it has all become decadent to-day. But the other personality to whom I am referring imbibed with fervent enthusiasm all that could be learnt from the still flourishing Mexican civilisation before the discovery, the so-called ‘discovery’ of America. In those days Mexican civilisation was still influenced by the Mysteries but was already in the throes of decline. When mention is made to-day of Taotl, Quetzalcoatl, Tezcatlipoka — the Beings of the Mexican Mysteries — little more is known than the names and a few scattered images. But this personality still knew that Taotl is a Being who as a cosmic, universal Spirit weaves in the clouds, lives in the lightning and the thunder. He knew too that under certain given conditions this Spirit could be invoked into consecrated water by enactments of sacred ritual. And he knew that Quetzalcoatl was a Divine Being who could take hold of man in his circulating blood, in the working of his breath. Living reality of Being was experienced in the Mexican Mysteries by the personality of whom I am speaking. He was reborn in a later age without any intermediate life as a woman. He had been a man in Mexico and was born again as a man. But in his life between death and rebirth this individuality passed through the supersensible world in such a way that in the development of his karma — this in turn was the outcome of still earlier incarnations not in Mexico but elsewhere — he bore through the Jupiter region all that he had experienced in Mexico: knowledge that had degenerated into superstition but was nevertheless replete with vitality, saturated with the fruits of older civilisations. In the Jupiter-sphere all this assumed the form of wisdom, but a wisdom that is in truth automatic, unconscious, when compared with the wisdom man should make his own by individual effort. When in the elaboration of karma between death and a new birth, the living, interweaving wisdom of the Jupiter-sphere pours over what has been experienced by a person in a previous earthly life, wisdom and its light can still shine forth in the subsequent life. But the wisdom, then, is founded on the experiences of earthly life. The individuality of whom I am speaking was born again in modern civilisation as Eliphas Levi. Eliphas Levi, therefore, had spent his previous incarnation in the Mexican civilisation, had then passed through the sphere of Jupiter with its wisdom, and in this sphere of Jupiter everything was worked through once again. But Mexican culture is a decadent culture and if you read the books of Eliphas Levi to-day you will find evidence of great wisdom spread out as it were over something extremely primitive. And one who has insight into these things will say: all this is Jupiter, but inferior Jupiter! When it is possible to survey the period of life from the 56th to the 63rd year — and I myself am now in this position — one gazes at the influences exercised upon man between death and rebirth by Saturn, by the Beings of Saturn. This is an even more startling vista, a vista that causes bewilderment, nay indeed actual pain. The Beings associated with Saturn are Beings who by their very nature take no heed at all of what they do in the immediate present; they act as it were unconsciously, under the sway of much loftier Beings into whose world they enter on reaching maturity. But as soon as they have done something, it stands there in powerful, living remembrance. Try for a moment to imagine yourselves in this position. I am not referring to any particular vocation or profession, but just picture yourselves doing something, no matter what, and not noticing anything at all while you are actually doing it; but once you have done it, it stands there in living remembrance as an intensely vivid picture. Take a singer: he sings but is unconscious that he is doing so; he is simply being used by the Gods to sing. Imagine a large audience listening to him; as long as he is actually singing he is aware of nothing at all; he knows nothing, either about himself or about what he is experiencing. But the moment it is all over and the concert ended, the whole event is there and does not fade away; it remains and forms part of the content of his very life. On Saturn, man is the past, only the past. Think of yourselves walking over the earth. As you walk you see nothing of yourself. But when you have gone a little further and look back, you see a little snowman. He is an image of yourself as you were before you took the last step. Again you observe nothing, but walk on, and another little snowman stands behind you. And so it continues, with more and more little snowmen standing behind you. To all of them you say “I”. — Now transpose this imagery into the spiritual and you have the key to the nature of the Saturn Beings. Between death and a new birth man has to encounter these Beings — Beings who live wholly in the past. And there are people who in the elaboration of their karma have a particularly strong connection with these Saturn Beings. The destiny of such people can be intelligible only when one looks back upon the period of life between the 56th and 63rd years. Again I will give an example in order to show you how karmic events in life point back to happenings in the supersensible world between death and a new birth. When I was speaking to you not long ago about the Hibernian Mysteries, I told you how difficult it is to approach these Mysteries, how they seem to thrust one back; and I spoke of the wonder and the sublimity of what was experienced in these Hibernian Mysteries in Ireland. I described how the pupil, having first learned to know the utmost depths of doubt and uncertainty in life, was led before two statues. The first consisted of a substance that was elastic throughout and the pupil was exhorted to touch or to press this statue again and again. The indents made in the statue gave rise to a feeling of overwhelming dread: it was as if one had constantly to cut, I cannot say into a corpse, but into living flesh — a horrifying experience for any sensitive person. The second statue retained every indent made upon it by pressure and its form was only restored, made intact, after an interval of time, when the candidate for Initiation was led before the statue again. I told you how those who were initiated in these Hibernian Mysteries experienced the glory and majesty of the microcosm, that is to say of man himself, and of the great world, the macrocosm. The impressions were tremendously powerful, of indescribable sublimity. One of those who had participated with intense fervour in the Hibernian Mysteries and had reached a high degree of Initiation, was destined after death to penetrate deeply into the Saturn-sphere. His earthly life within these Mysteries was the outcome of still earlier incarnations. He had been profoundly moved by the grandeur and majesty of what he had experienced in the Mysteries of Hibernia. When I was describing them to you I told you that in spiritual vision, without any kind of connection in physical space, the Initiates beheld the actual Event of Golgotha. The individuality of whom I am speaking lived through all these experiences again with great intensity of feeling and was subsequently born again in our own period of civilisation. Picture to yourselves what this personality acquired by virtue of the fact that the karma of his last life had been elaborated, wrought out in the Saturn-sphere. Everything presented itself to him in the light of the past. He beheld his experiences in the Hibernian Mysteries in the light cast by the Saturn Beings over the far, far distant past, and majestic pictures of pre-earthly times, of Moon periods and Sun-periods came alive in him. When he was born again, all that before this earthly incarnation had been bathed in the past, coloured by the past, transformed itself into mighty pictures — idealistic, albeit visionary pictures which cast their light into the future and came to expression in a transcendental romanticism. In short, this individuality who had once been initiated in the Hibernian Mysteries, was born in our epoch — our epoch in the wider sense — as Victor Hugo. In its romanticism, in its whole configuration, Victor Hugo's life bears the stamp of karma wrought out in the Saturn-sphere. These are small contributions towards an understanding of how karma originates and takes shape. As I said, the best way of getting to understand karma is to study concrete examples. For the study of how karma is elaborated in the case of men like Voltaire, Eliphas Levi, Victor Hugo, is full of the deepest interest and leads to a knowledge of the connection of the human being on earth with the macrocosmic, spiritual being engaged in the elaboration of karma between death and a new birth.